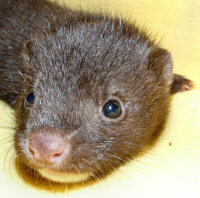 River and Rain are two wild mink siblings that were orphaned when their burrow flooded during the storms. A local family heard cries coming from the ditch in front of their house. They went outside to look for the source and found River and Rain, cold, wet and desperately in need of help. The rescuers safely scooped up the orphaned mink and rushed them to the Wisconsin Humane Society Wildlife Rehabilitation Center. Once at our facility, our wildlife rehabilitators quickly dried and warmed the infants. They were so young that their eyes and ears were still closed. We estimated their age to be only about three to four weeks of age. Even at such a young age, they were voracious eaters. We fed River and Rain specially made formula every few hours. At 5 weeks, their eyes had opened and at eight weeks we moved them to an outside habitat to begin preparing them for release. Their habitat included several logs and branches to climb, hide in and tunnel under. Mink are quite fond of water, so we also added a mini-pool to their now resort-like accommodations. A few weeks in their outdoor enclosure had River and Rain ready for release. Two of our summer Wildlife Interns released the mink in some great mink habitat not far from where they were found. Your support of our Wildlife programs helps us save the lives of orphaned wildlife like River and Rain. Please consider making a contribution today.